The Oase Aquarius Universal are a range of versatile multi-purpose, clean water pumps, ideal for supplying pond fountains & water features. The Oase Aquarius Universal are a range of versatile multi-purpose, clean water pumps. These high-end water pumps are ideal for supplying pond fountains, waterfalls, streams and water features. The range consists of 14 models with flow rates ranging from 430 to 40,000 litres per hour, and vertical lift from 0.75 to 11 metres. See below for comparison chart and performance data. The OASE Aquarius Universal are broad range of multi-purpose water feature pumps. This range of pumps consists of three Aquarius pump types. At the lower end, the five models in the Aquarius Universal Classic range for small water features. The mid-range consists of six Aquarius Universal Premium models, and at the higher end, the four powerful Aquarius Eco Expert pumps built for high flow applications. 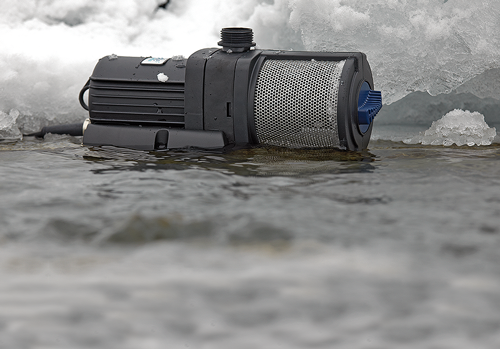 OASE Aquarius Universal Classic pumps are versatile, low power pumps for smaller water features. These pumps range from 440 – 2000 litres per hour, with pumping head between 0.75 and 2.0 metres. All pump models are suitable for underwater installation in a pool, pond or water container. The 4 higher models are also suitable for dry-installation out of water, with a water supply pipe connected to the suction inlet to flood the pump. 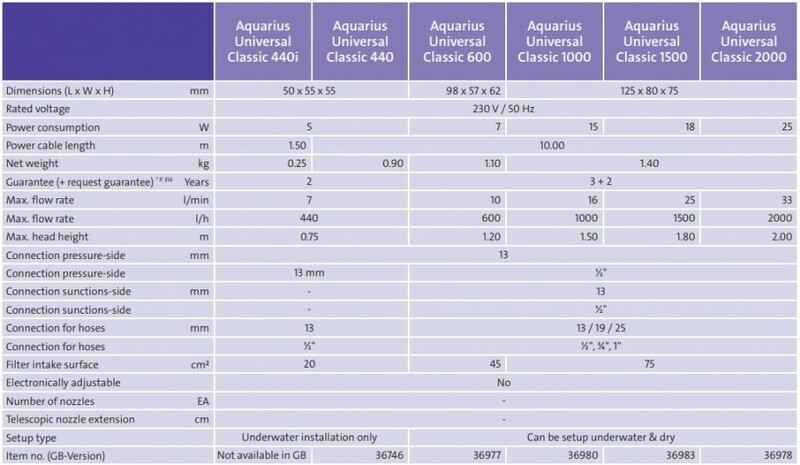 Ideal scenarios for Aquarius Universal Classic pumps include indoor water features and self-contained outdoor water features such as wall mounted stone spouts. These pumps can accept a variety of hose pipes, ranging from 12mm to 25mm inside diameter. Aquarius Universal Classic pumps all feature an integrated flow regulator and all are supplied with 10 metres of power cable. OASE Aquarius Universal Premium pumps are stable and robust pumping units which range in maximum flow rates, from 3000 – 12000 litres per hour. This range of pumps are a reliable option for supply of water to medium and larger water features. Pumping height varies between these models, starting at 3.2 metres, to a height of 7.0 metres from the largest model. 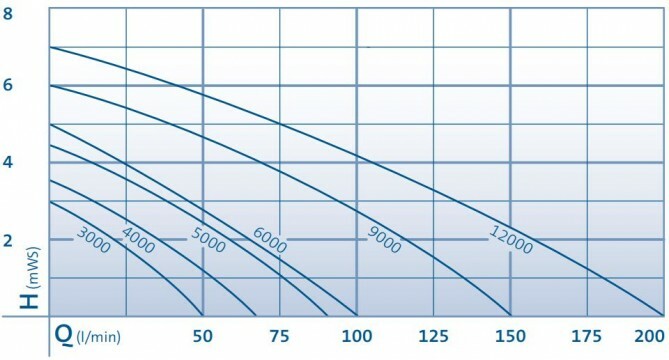 The smaller two models in the range (3000 and 4000) are Eco pumps, meaning the performance output versus power demand is especially good with these two pumps in particular. Larger models 5000 to 12000 are electronically adjustable if used with an electronic regulation device. All Aquarius Universal Premium pumps feature a manual flow reducer, positioned at the far end of the fine mesh, stainless steel strainer. Stepped hose connectors allow larger hoses up to 38mm inside diameter to be used. 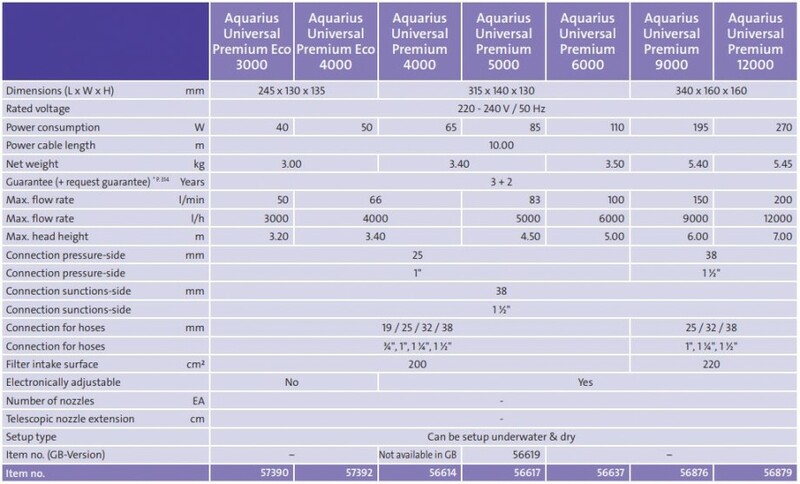 Aquarius Universal Premium pumps can be submerged in water or dry installed. 10 metres of cable comes as standard on all Premium models and all of these pumps carry and extended OASE Guarantee. OASE Aquarius Eco Expert pumps are heavy duty, high flow pumping units designed specifically for more demanding water feature applications where higher flow rates are required, or greater pumping height is a factor. Aquarius Eco Expert pumps can be used for large, cascading streams and water features, or used as fountain pumps by attaching a fountain head to the outlet. 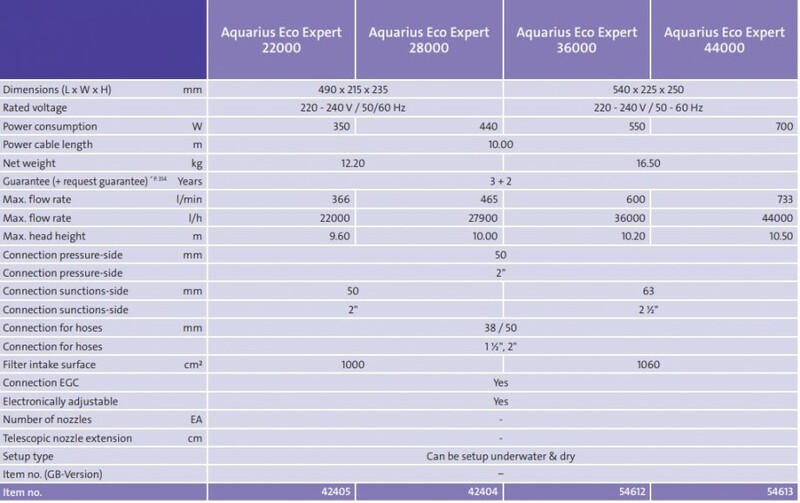 Aquarius Eco Expert pumps are EGC compatible, meaning and EGC control device can be connected, enabling a range of speed controls and variable speed dynamic programs to be selected via a control panel, or remotely on a Wi-Fi enabled device and app. Aquarius Eco Expert pumps start at 22,000 litres per hour, with the largest unit capable on pumping 44,000 litres per hour. With EGC enabled flow rates and power use can be controlled and monitored. 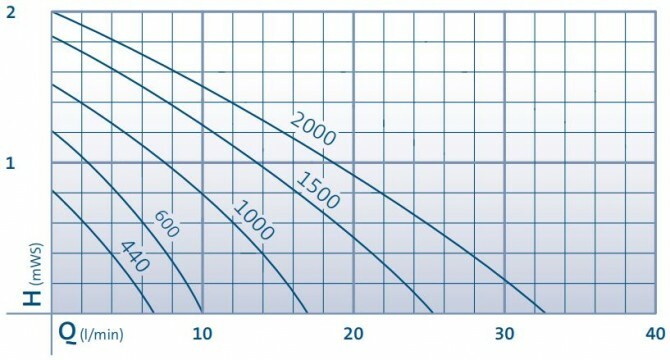 Maximum pumping heads range from 9.60m to 10.50m. These pumps are built for use with only larger hose pipes of 38mm and 50mm internal diameter. Aquarius Eco Expert pumps come with 10 metres of power cable and all model carry a 3 year guarantee with 2 year free extension period.